By unleashing a genetically modified virus onto microscopic electrode wires, researchers from MIT have shown that the performance of lithium-air batteries can be significantly improved — a remarkable breakthrough that could revolutionize the way our electric devices are powered. Indeed, lithium-air batteries have generated considerable buzz over the years because of the way they can increase power without having to increase weight, an attribute that could lead to electric cars with much greater driving range. But engineers have struggled to to create the durable materials required for the batteries' electrodes, and increase the number of charging-cycles the batteries can withstand. To overcome these limitations, researchers from MIT demonstrated that by adding bioengineered viruses to nanowires during the production stage — tiny electrode wires about the width of a red blood cell — some of these problems could be alleviated. This virus, called M13, works by increasing the surface area of the wire, which in turn increases the area where electrochemical activity takes place when batteries are charged or discharged. 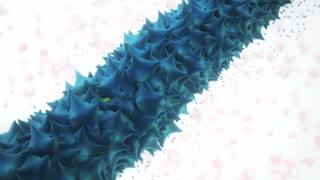 In a process similar to how an abalone pulls calcium from seawater to grow its shell, the nanowires, with the help of the M13 virus, pulls molecules of metal from room-temperature water, which the virus then binds into specific structural shapes. Specifically, the viruses produce manganese oxide wires — and they have the rough, spiky surface required for the desired increase in surface area. The final part of the process involves adding a small amount of metal, namely palladium, to increase the electrical conductivity of the nano wires. Taken together, these modifications show that it may soon be possible to create a fully functional battery with an energy density that's two to three times greater than today's best lithium-air batteries — the energy density being the amount of energy that can be stored for a given weight. Read the entire study at Nature Communications: "Biologically enhanced cathode design for improved capacity and cycle life for lithium-oxygen batteries."